iTunes in the Cloud has been with us for a few months now. New and existing purchases available in iTunes and also on your iOS devices via the cloud. If you’ve bought most of your music from Apple then your pretty much sorted but what if the vast majority of your music has been bought elsewhere? What about the ripped cd’s and, lets be honest, the music acquired via torrents, sharing groups etc over the years? Thats where iTunes Match comes in. Launched last month in America it was rumoured by some analysts as being well into 2012 for the UK but last Friday after a premature launch the previous day, Match was available for users in the UK. iTunes Match is a subscription service from Apple. It costs £21.99 a year ($24.99 in the US but I should educate myself rather than grumble about UK pricing) and once you’ve signed up it will automatically review each year unless you decide to cancel it. Once subscribed your whole music collection is matched and made available online. iTunes analyses your music and those tracks that are already available on the iTunes store but weren’t originally bought from iTunes are called ‘Matched’. The matched tracks are then made available on your iOS devices for download just like iTunes in the Cloud has already done for your iTunes purchases. All users will still have a percentage of music that is unmatched – not purchased on iTunes and the Match service couldn’t find the same track on the iTunes store. For those tracks Match will upload them to your iCloud account and make those available to your iOS devices (and other computers with iTunes and the same authorised account). The main limitation with iTunes Match is that it will upload a maximum of 25,000 tracks. Thats quite a large music collection and only applies to uploaded tracks excluding those purchased and matched. However Apple have assumed the worst case scenario in that if your music collection is over 25,000 tracks in size then iTunes Match will fail to run. The workaround is to temporarily reduce your library to less than 25,000, subscribe to Match and let it do it’s stuff and once it’s complete, assuming it has uploaded less than 25,000, add the rest of your library. A bit of hassle but it’s pretty easy to do. Another restriction is that Match will only work on tracks at a higher bitrate than 96Kbps but I only have a couple of spoken tracks at that quality from a library of over 11,000 so it’s not a problematic restriction. So Match put’s all your music in the cloud but the main benefit for me is that the matched tracks are available at 256Kbps AAC DRM-free quality no matter what the bitrate is of your original track. Wow. The second main benefit is not only are the matched tracks of better quality, but they are properly licensed music no matter what the original source was – ripped, torrents, Napster…Limewire even. Double wow. I’m sure thats why this is a paid service – the online storage that Match requires but also the licensing of the music. One question I had was what happens if I don’t re-subscribe? Do I lose the matched music? The answer is no – you only lose the iCloud storage and the ability to download your library on any of your devices. The first step for me was to backup my iTunes library. I was unsure as to what if any damage would be done to my library and I didn’t want to lose tracks, album art or metadata in the process. With that out of the way I signed up for iTunes Match on Friday morning. 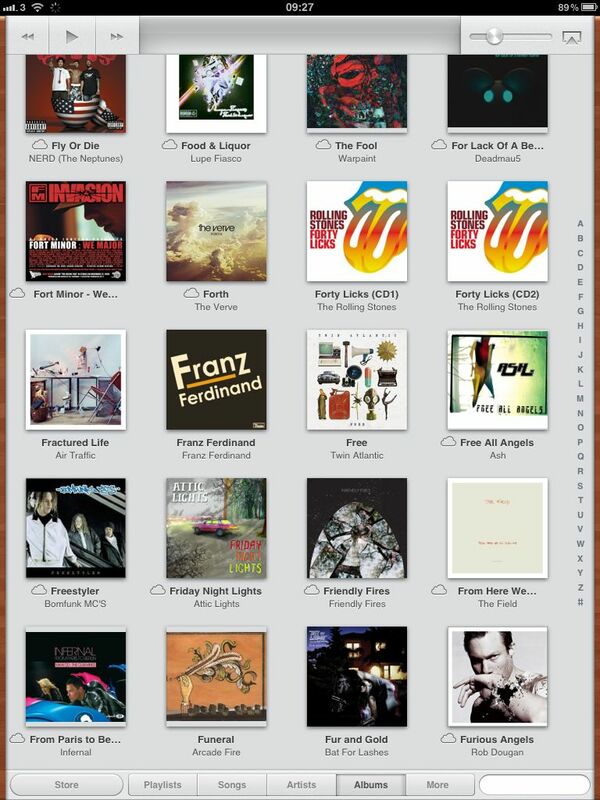 It was quick and easy to do and after a couple of minutes iTunes Match started to analyse my library. Once that was complete (5-10 mins) it then started matching with the 20 million tracks available on iTunes. I expected this to take hours but was pretty speedy. I’m not sure what Match uses to ensure it finds the right track but think it must be a combination of tags, track length and estimated sizes. Scratch that – it is using Gracenote’s MusicID service according to this Cult of Mac post. Once the match process was done, 6381 tracks out of 11143 were available in iCloud. The nest step was to seed the remaining tracks – all 4876 of them. That was around 11GB of data that was uploaded to iCloud and it took a few hours. Interestingly the upload never seemed to complete. There was no network traffic but iTunes Match was still trying to upload…something. I think the service got stressed on that first Friday and that’s what I was seeing. I also saw a couple of tweets saying the service had been suspended. 24 hours later and when I relaunched iTunes the Match service spent some time and this time it finally completed. I’m not sure how long this took but I eventually had all of my tracks available in iCloud. Great. Now what? First test was how Match works on iOS. I grabbed my iPad and enabled iTunes Match and got a message that my music library on this device would be replaced. From other podcasts and forums I’d seen, this meant the iPad music would be wiped and I’d start again. However the music that had been sync’d to the iPad remained in place and eventually (20 mins or so) my whole library was displayed with cloud icons next to those tracks that were available to download. Playlists are also sync’d via iCloud and you can make changes to the playlists from any device and those changes will be saved across all devices. After some digging, this excellent article from Macworld explains the replacing/supplementing issue – If your iOS device was synced to a music library you’ve connected to iTunes Match, it will only supplement your currently synced content, leaving already-synced songs alone and adding iCloud download icons for those that haven’t been added to your device. 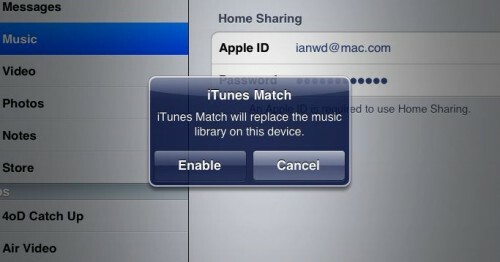 If it’s synced with music not in your iTunes Match collection, however, all of that will be replaced. Download speed over wifi is great, 3G – mileage will vary as expected. The tracks will start playing before they are fully downloaded. It’s not streaming, but pretty close. If I’m honest though, how often am I going to want to download tracks when I’m away from my Mac? I can see it happening the odd time but thats about it. With Match up and running the next job was to replace my old crummy tracks with spiffy good quality 256Kbps AAC versions. I created the following playlist (hat tip Macworld) which highlighted the tracks available to download that were of better quality than I currently had. Many of my tracks were ripped from CD and I stuck at 192Kbps at the time. I also had quite a few albums acquired form less honest sources that were of low quality. I selected a couple of test albums, held down the option key and clicked delete. I sent the albums to trash but kept them on iCloud. I setup a second playlist that showed music on iCloud and not on local machine, selected both albums and clicked Download. Thirty seconds later I had two albums refreshed at a higher quality but most importantly my ratings and played count were retained from the old files. With that test concluded, and safe in the knowledge I had backed up everything, I selected all files of a lower quality, deleted them and then kicked off the download. I them went out for the morning. On my return iTunes had finished – 6548 tracks downloaded which is just over 53GB in total. Boom. So thats iTunes Match. If I’m being harsh it’s the new form of Apple tax – replacing the yearly subscription that was MobileMe with iTunes Match. However it’s a service that delivers an upgrade to the quality of your music, gives you legitimate copies of your music irrespective of source (when it was announced in June 2011 I couldn’t believe it was the case) and allows you to download your music from anywhere in the world without leaving your machine running at home…or needing to carry it all with you. One final benefit is that your music collection is backed up to the cloud. In event of a hard drive loss you can download your full music library to an existing or brand new machine. Compared to the Amazon S3 costs, that alone is worth £21 a year for me. For me it’s highly recommended – just make sure you’ve taken a backup before proceeding just in case. Thanks for helping get this started, dropping out enough tracks to get below the limit worked a treat. And having not really read much about Match I didn’t realise you could then ‘upgrade’ your tracks as well. That’s quite amazing!! I think that’s part of the problem – they’ve not really publicised Match nor what you get from signing up. I think I’ll give this a go… High quality versions of my mp3s sounds like a bargain at that price, shame (I assume) it doesn’t sync to android phones! hmm, I forgot iTunes doesn’t play nicely with my Windows Home Server (v1) either. I can’t install newer versions of iTunes as it says my windows is too old. Guess I won’t be doing this then! Thanks for the 256k AAC upgrade tip and method (link). Downloading over 6,500 higher rate music files now.